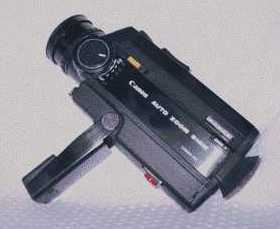 The Canon Auto Zoom 318 M was produced in 1972, but the black model was commercialized in 1976. This movie camera is equipped with a lens Canon Zoom C-8 10-30 mm f:1.8; it is Macro. Inside the grip there are the batteries. The movie camera body is black. Its weight is kg. 0,470 e the size is the following: 60x81x172 cm. This movie camera was very common. 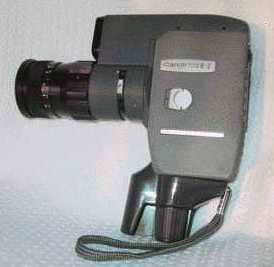 The model Canon Reflex Zoom 8 was produced in 1959, but the model 8-2 in 1961. Canon produced 100.000 models of this movie camera. The model in my collection is equipped with a lens Canon Zoom C-8 10-40mm f:1.4. Its weight is kg. 1,250 and the size is the following: 60x140x20 cm.